Home Film Film Reviews Oh God, mother! Blood! Blood! This anti-Christian celebrity satire is Darren Aronofsky's latest mindbender. 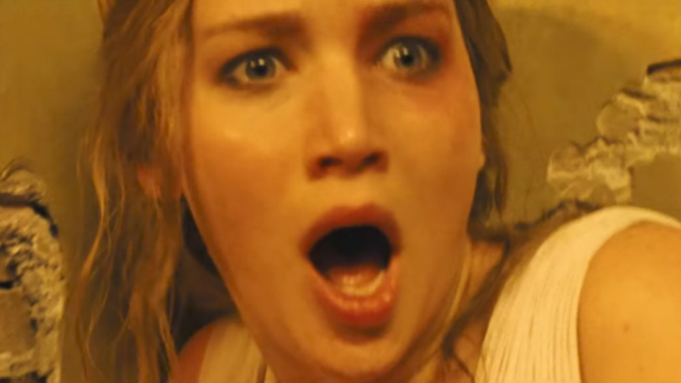 The horror starts and doesn't stop for Jennifer Lawrence in 'mother!" My movie reviews have been in hibernation for a couple of weeks, but mother! is well worth coming out of it for. After all, the meditative, mystical Darren Aronofsky who made The Fountain and Noah is all well and good, but I much prefer the face-melting, bad-acid-trip, this-movie-is-eating-my-brain Aronofsky, and this parable is higher on the WTF meter than anything he’s ever made, which is saying volumes. Jennifer Lawrence stars as the titular mother who, like all the other characters in the film, has no name. She lives in a secluded mansion, which she’s busy remodeling after a fire, in the middle of a forest clearing with her writer husband (Javier Bardem), who’s creatively blocked and later revealed to be sexually impotent, just to drive the point home. Suddenly an orthopedic surgeon (Ed Harris) shows up at the house, mistaking it for a bed-and-breakfast, and the husband embraces this complete stranger like a best friend. Soon, the man’s wife (Michelle Pfeiffer) turns up as well and starts acting like the houseguest from hell, criticizing the renovation work and assailing our heroine as a bad person for not having children. The early going frequently plays like an absurdist drama, but there are hints of the supernatural in play. There’s a glowing crystal in the writer’s library that appears to have magical powers. The heroine never leaves her house, and we get heavy insinuations that the house itself is a living organism. So what the actual crap is going on here? The studio’s promotional materials have done their best to conceal what this film is about, and you will be kept guessing through the first hour or so whether our heroine is agoraphobic or simply having a psychotic break like Natalie Portman in Black Swan. In point of fact, the movie has more in common with David Lynch’s Mulholland Dr. and Lars von Trier’s Melancholia than with any of Aronofsky’s previous films in its dreamy, nonrealistic evocation of a woman’s tormented mental state. The house is a great piece of production design by Philip Messina, with its gigantic rooms and tight corridors, allowing Aronofsky to film his protagonist in claustrophobic frames within frames. Though the rooms have huge windows, somehow the house always seems to be dark even in broad daylight thanks to cinematographer Matthew Libatique. This nerve-wracking environment makes mother! into the haunted-house movie of the year. The movie is bisected by the mother’s pregnancy, which happens halfway through. After that, the film’s intentions become clearer. It’s about the costs of living with an artist who loves his own creative genius (and the public adulation that comes with it) more than he will ever love another person. Late in the film, after the heroine has realized that she and her child haven’t been enough for him, he responds, “Nothing is ever enough. If it was, I couldn’t create.” This may well be Aronofsky’s damning judgment on himself, a lifelong bachelor whose relationships with women have been tortured. There’s a lengthy sequence in the second half that shows the filmmaker’s skill at building nightmares, starting when a group of adoring fans make a pilgrimage to the author’s house. As the fans accept the writer’s exhortations to come in, they become a crazed mob, murdering one another and taking the house apart so they can build a shrine to the writer. In the middle of the mayhem, up pops Kristen Wiig, cast eerily perfectly as a publicist who addresses the heroine in fawningly polite tones even while she’s going around executing bound and gagged prisoners by shooting them in the head. Contrasting with the sparseness of the first half, this part of the movie plays like a Hieronymous Bosch painting, where so much inventively horrible stuff is going on that you don’t know where to look. However, Aronofsky’s larger ambitions reveal themselves if you read this as a blasphemous parody of the Bible. 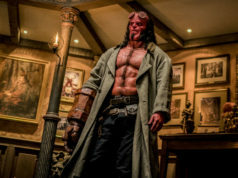 The story is loaded with Biblical parallels, with the two houseguests as Adam and Eve and their two sons (played by real-life brothers Domhnall and Brian Gleeson) coming in and getting into a vicious fistfight that ends in fratricide. Despite her Christ-like suffering, the mother is the Virgin Mary whose baby suffers an awful fate at the hands of those fans. Presiding over it all is her husband, a cruel and monstrously selfish God who gleefully shares all his possessions with his disciples while vampirically sucking the life out of his wife and the string of young women admirers of which she’s only a small part, demanding her unconditional love even after she dies. By positing that God is evil, this movie is nothing less than an act of heresy, and it’s pretty awesome as such. Its lack of tragic impact keeps it from true greatness, and I think this is down to Lawrence. She does give her all in the latter scenes, where the mother is severely beaten and scourged by her husband’s fans both before and after delivering her baby. Still, her character rebels (albeit unsuccessfully) against the misogynistic mythology that she’s been placed in, and Lawrence doesn’t show the awareness that she should. How could she miss the absurdity when the heroine notes that the mourners at a funeral are now busy painting the walls? This role needed someone more precise and more comfortable with its self-laceration, like Portman. mother! is notably less wrenching than Aronofsky’s best work, but like most of his work, it remains harrowing, brilliant, and deeply troubling. Starring Jennifer Lawrence and Javier Bardem. Written and directed by Darren Aronofsky. Rated R.